Thinking outside the box is something Eric Capps obviously excels in doing. After a successful 2015-16 season, the Red Grizz team is back in full force for 2016-17, again with the sponsorship of the Utah Jr. Grizzlies youth organization. “This team is meant to complement what the respective high school teams are offering,” Capps said. “We feel that we have a good niche where we keep costs low, but offer an opportunity for kids to continue to travel and play in a few tournaments throughout the season. We wouldn’t have a team without the Jr. Grizzlies sponsorship. The current Red Grizz team is made up of highly-motivated former Salt Lake Lightning, Jr. Grizzlies and Utah Golden Eagles players. 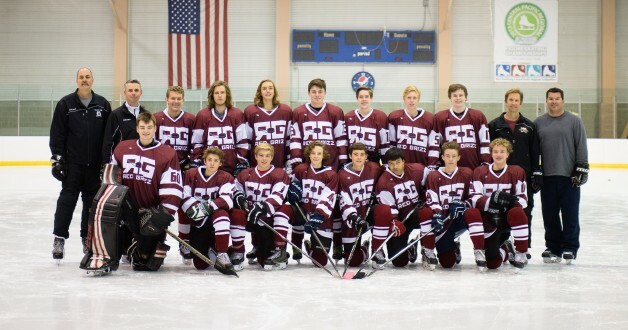 The 2016-17 Red Grizz team is comprised of Connor Allen, Carson Angeroth, Alex Brown, Marcus Capps, Nolan Carpenter, Cade Casto, Sam Flores, Zac Graham, Jeremiah Iba, Jordan Jaramillo, Jeff Kain, Burke Larsen, Tate Larsen, Dylon Pearson, Maxwell Pereira, John Teynor and Trevor Tilk. Capps is joined by fellow coaches Mike Brown, Ryan Larsen and Jeff Tilk. This year, the Red Grizz features nine returning players and has added eight new team members. “We are still a young team, and we only have a couple of players that aren’t eligible to play 16U, but I feel with the talent and experience these kids have that we will do well this year,” said Capps. As far as which high schools are represented on the Red Grizz, Capps said, “We have the Salt Lake Valley covered” with players from East, Olympus, Alta, Bingham, Brighton, Murray, Skyline, Stansbury, Bountiful, Oquirrh and the Salt Lake Stars. The coaching staff for the Red Grizz represents four different high schools – East, Olympus, Bingham and Brighton. As far as the schedule for the season, Capps reiterated that playing high-level, local competition is the top priority. “One of our goals is to keep costs as low as possible, so we try to stay as close to home as possible and play in either high school tournaments or 18U A-level tournaments,” said Capps, whose club will play at the Grizz Cup in January. After this season, Capps noted that there will “absolutely” be another Red Grizz team in 2017-18. “We are in for next season no matter what,” said Capps. “Determining if a season ‘goes well’ isn’t completely about wins and losses, even though a pile of wins is nice. Wins and losses are forgotten over time.